The category-straddling Kawasaki Versys 650 enters its third iteration and first major update of Kawasaki’s VERsatile SYStem. In 2015, the sporty yet friendly Versys 650 arrives in two forms, both of which feature a new, chiseled appearance that is much more handsome than previous versions. Its new nose also includes a larger windshield that is tool-lessly adjustable, and revised footpeg locations supply additional legroom. 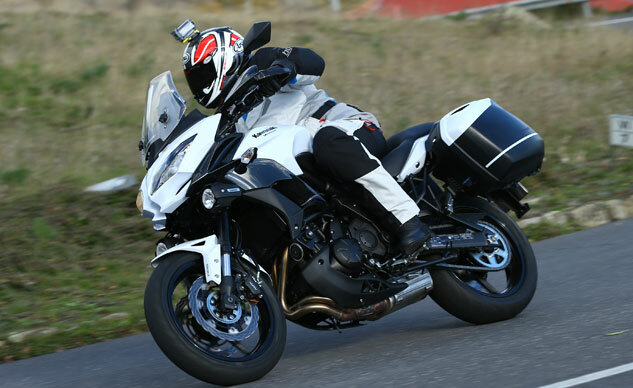 The LT version adds hardshell saddlebags and hand guards that expand its sport-touring capabilities. Following a day spent riding the Versys 650 over the twisty roads of Sicily and its Mt. Etna volcano, we’re convinced Kawi’s latest version is the best one yet. And, critically, it offers loads of value. The base Versys 650 retails for a reasonable $7,999, while the 650 LT demands just $700 extra to enjoy locking saddlebags and hand protection. See below for the sights and sounds of riding the Versys 650 LT around the island of Sicily. Stay tuned for our video review of the 2015 Kawasaki Versys 1000 LT, coming soon.